Alexa Chung was pretty in pink at the launch photocall of her Alexa Manicure Collection with Nails Inc at Debenhams in London. For the occasion, she wore a mock neck dress with an A-line waist from Emilia Wickstead’s Spring 2014 collection, anchored with a pair of Bionda Castana Nicole Lace Pumps. Pretty! 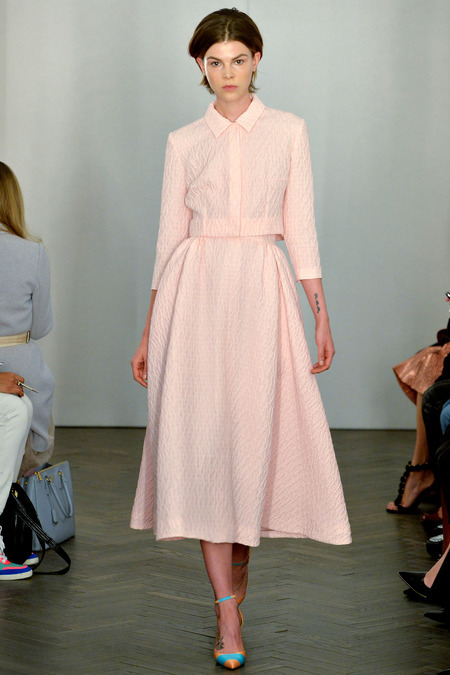 This Spring 2014 runway ensemble is similar to Alexa’s dress. Her black lace and mesh pumps feature cord fastenings through the front and functional 3″ heels. Bionda Castana’s Nicole Lace Pumps retail for $785. Visit www.net-a-porter.com to purchase and www.biondacastana.com for more information.